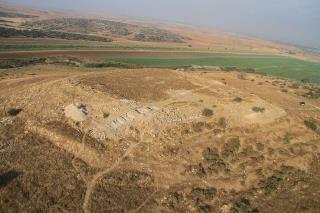 (Newser) – Archeologists in Israel have discovered a 3,300-year-old complex where an ancient cult likely gathered, UPI reports. The complex, at a site known as Tel Burna, is made up of rooms surrounding a giant courtyard measuring 52 feet by 52 feet. It's not certain who the cult worshiped, but based on the "letters of Ugarit" (a site located in what is now Syria), experts figure it was probably the Canaanite storm god known as Baal. Canaanites, the International Business Times explains, were people living in the region between approximately the early Bronze Age and the beginning of the Common Era. The complex yielded an array of items including pieces of face masks, person-sized ceramic jars, and animal bones that may indicate animal sacrifices took place there. And this is new. Isreal is the land of the ancient cult. So this proves that the Jews did not always own the geography called Israel they live in and claim from Biblical references. It is actually STOLEN & OCCUPIED LANDS that many peoples have "owned". Huh? What do you make of that shitbag Netanyahu?